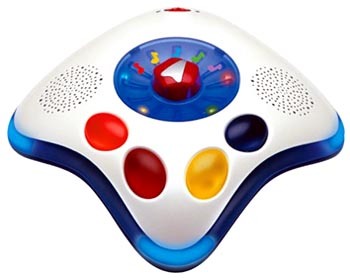 Neurosmith's revolutionary Musini magically converts your child's energy into music and creativity! Musini's patented MagicSensor transforms any room into a musical playground where every step, turn, touch, and tap activates a unique musical response. Children simply select their favorite musical styles and instruments and start moving! Musini does the rest - sensing the strength and speed of each vibration and responding with a totally personal and unique musical composition. Mini-maestros explore tempos, rhythmic patterns, and musical structures and they'll never make the same masterpiece twice! Musini encourages physical expression and creativity, rewarding each movement with inspiring music. Children can also explore various musical styles, instruments, tempos, and structures, cultivating a deeper understanding and lifelong appreciation of music.